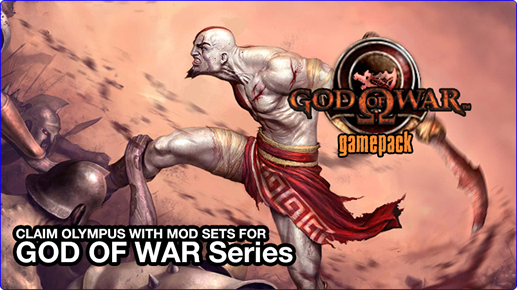 The God of War Series Gamepack for Titan One has 5 distinct MODS including Slow Motion, Auto Double Jump, Auto Stone Escape, Auto Button Tap, and R2 Evade. Player LED 1: Controller in regular mode, God of War MODS are disabled. NOTE: This MOD doesn't work on God of War Ascension. Automatically performs the highest double jump by just holding jump button. Hold jump button to perform double jump and open Icarus wings, if it's available. Automatically performs the commands required to escape from petrified state (Medusa & Gargoyle) by pressing R3 button. This MOD guarantees escape from petrification in the shortest time possible. Automatically performs the actions "Quick Attack", "Heavy Attack", "Grab / Physical Attack", "Magic Attack", "Heavy Combo" and "Quick Combo" when the corresponding button is pressed 100%. Pressing the button normally keep the original functionality. We recommend use the Dualshock 3, or any controller that has pressure sensor buttons. Check the configuration session below for option selection. God of War Ascension: use combined with R1. This MOD allows you to perform the action "evade" by the R2 button, indicating the direction of rolling through the left analog stick. The original function of the R2 button can be performed via the combination L1 + R2. Press R2 to perform evading movement to direction pointed by the left analog stick. The controller button layout on God of War Games is very similar since it's release. However Santa Monica Studios, from one release to other, always made small changes on the controller layout. For that reason it is important configure the Gamepack to match the game you are playing. Makes the game run at lower speed, allowing the player react faster to enemies movements. PLEASE NOTE: This MOD doesn't work on God of War Ascension. Automatically performs the highest double jump just by holding jump button and open Icarus wings, if it's available. Automatically performs the commands required to escape from petrified state (Medusa & Gargoyle) by pressing L3 button. This MOD guarantees escape from petrification in the shortest time possible. Automatically performs the actions "Quick Attack", "Heavy Attack", "Grab / Physical Attack", "Magic Attack", "Heavy Combo" and "Quick Combo" when the corresponding button is pressed 100%. Pressing the button normally keep the original functionality. We recommend use the Dualshock 3, or any controller that has pressure sensor buttons.